The famous Corinth Canal, which separates the Peloponnese from mainland Greece, connects the Corinthian Gulf with the Saronic Gulf. 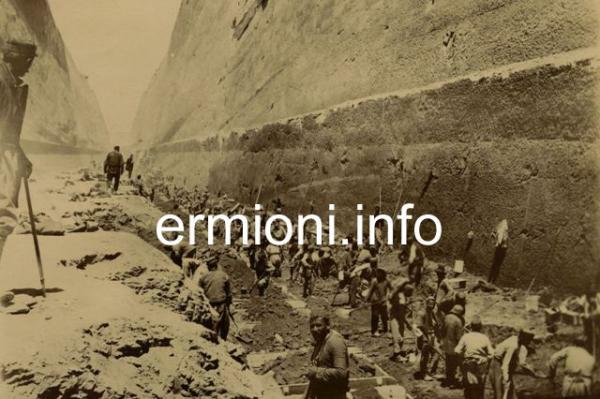 The canal was an idea and dream that dates back over two thousand years, however, the construction was only completed in the late 19th Century. The canal stretches for 6.34 kms and provides a waterway between the Ionian and the Aegean seas. Prior to the canal being constructed ships had to travel all around the Peloponnese, which added approximately 185 nautical miles, and several days more travel to their journey. Alongside the present canal, excavations in 1956 revealed part of the Diolkos, an ancient paved road built before any canal existed. This allowed warships and smaller boats in antiquity to be hauled overland between the two Gulfs, merchant ships would dock at either end and their cargo's transported by this overland route. 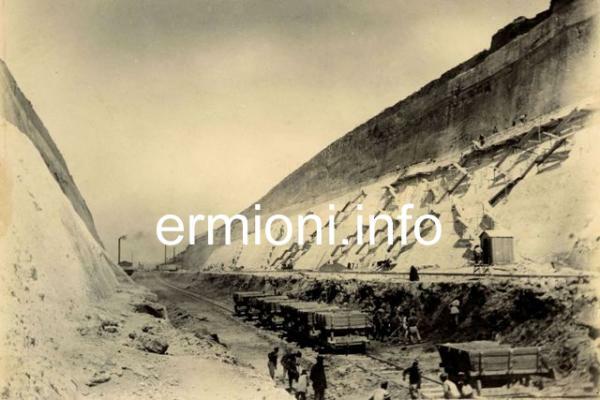 The first serious attempt at the canals construction was by Emperor Nero, who in 67 AD, announced to spectators at the famous Isthmian Games (held every 2 years) only 1km away at Isthmia, that he was going to dig the canal that would "connect the two seas". It would have been one of the wonders of the ancient world, had Nero been able to finish what he began with a golden shovel. Even though Nero had approximately 6,000 slaves working on the canal for months, his master-plan never materialised. The idea of the canal was left for centuries, until it was revived again during the late 1800’s. 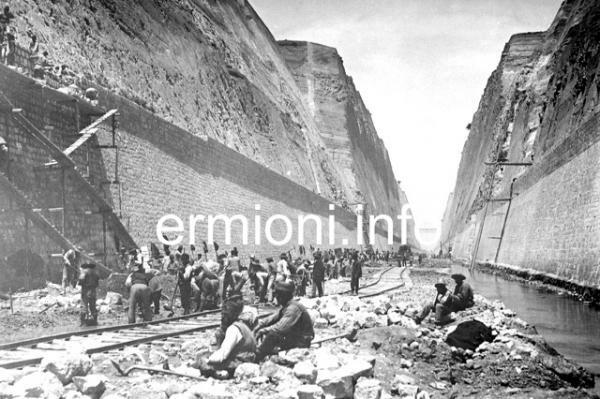 After several false starts, the Corinth Canal was finally completed, and following a grand opening ceremony on 6th August 1893, in the presence of King George I of Greece and Franz Joseph, Emperor of Austria and King of Hungary, the new canal was opened to traffic on 28th October 1893. 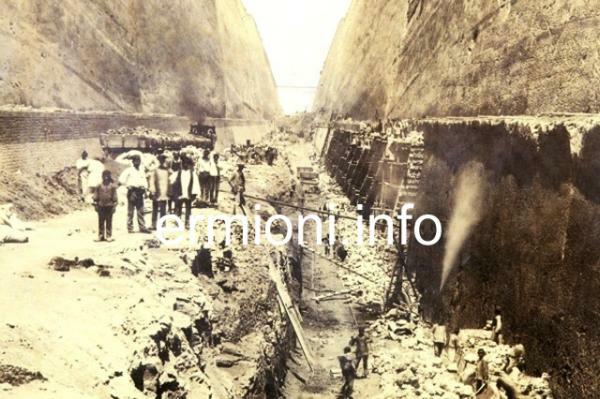 Two Hungarians, Istvan Turr and Bela Gerster, designed, organised and directed the construction of the canal, with the actual labour being carried out by a combination of French and Greek workmen. A new memorial now stands on the Athens side of the canal, dedicated to the two Hungarians. 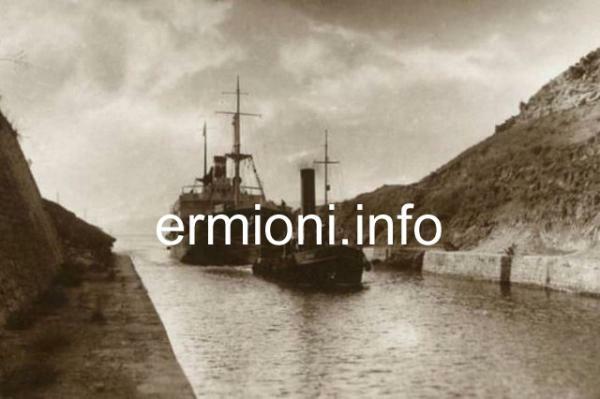 The Corinth Canal was actually based on the world famous Panama and Suez Canals. 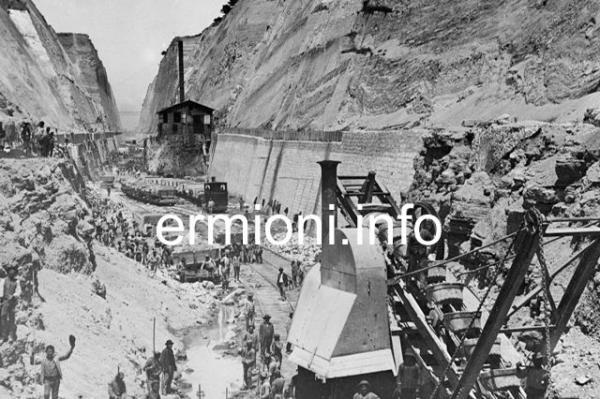 Following its grand opening in 1893, navigational problems and periodic closures to repair landslides from its steep walls, the Canal failed to attract the level of traffic expected by its operators. 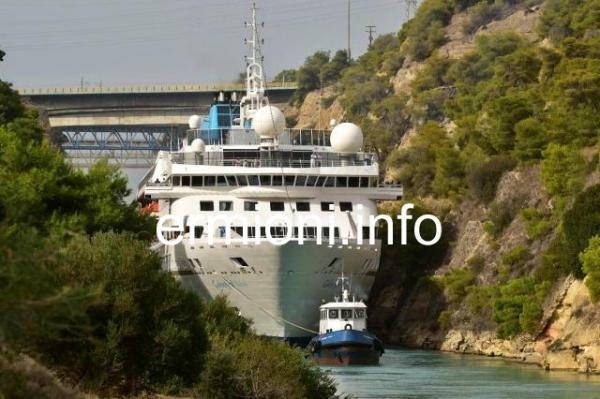 The Corinth Canal is now used mainly for tourist traffic, as many modern ships are too large to pass through any more. However, the canal is still used by many smaller ships, boats and yachts and there are also cruises organized, where you can travel through the canal in style. For those with a little more adventure inside them, there is 'bungy-jumping' available, where you can dive off the main road bridge and experience the jump of your life, all for 60 Euros. For those of you with not so much adventure, or finance, you can stand on the bridge and watch the brave bungy-jumpers dive off the bridge, as well as look down on the passing ships, boats and yachts, though not at the same time. 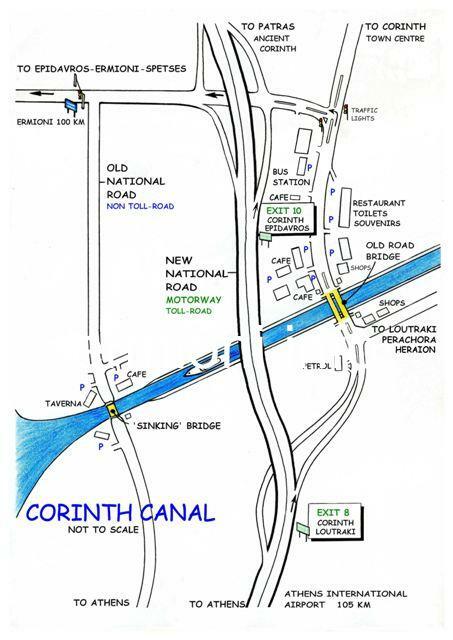 The Corinth Canal area also has a few important features to offer, all within a couple of minutes walk from the original road bridge. The first is the Isthmia Bus Station which is the transport hub of the Peloponnese. From here coaches travel East towards Athens, West towards Patras, Pyrgos and Olympia, South towards Argos, Nafplio, Epidavros and Kranidi (K-TEL Argolidas) and SouthWest towards Tripoli, Kalamata and Sparta. The second feature is the Splash Water Park, which is a popular 'day-out' for children and young adults from the surrounding region. The waterpark is open every day between 10:00 and 19:00 from May until September. Tel: +30 27410 84050. Further facilities available at the Canal area include cafes, restaurants, tavernas and tourist souvenir shops, situated at each end of the canal road bridge, a welome rest-stop for travellers between Athens and the Peloponnese. The two 'sinking' bridges, originally called subducting bridges, are situated at both ends of the Canal and are unique in Greece. They are the only bridges to lower themselves under the water, to allow a passing boat to cross above them. The two bridges were only constructed in 1988 and submerge approximately 10,000 times every year. The NW bridge is at Poseidonia, linking Corinth with Loutraki. The SE bridge is at Isthmia, linking Isthmia with Athens. Visitors can stop and park next to the Isthmia 'sinking' bridge on the old National Highway, which links the Peloponnese with Attica. There are a couple of tavernas close to this bridge, on each side of the Canal, where you can sit and enjoy a relaxing cool drink while viewing the whole operation. You will see this bridge submerging under the water, and then reappearing again once the vessel has sailed by. Very seldom mentioned in the guide books, the 'sinking' bridges are really worth seeing in action, particularly the bridge at Isthmia. When raised, the view from both the subducting bridges of the whole canals' 6.34 kms length, is equally quite spectacular.